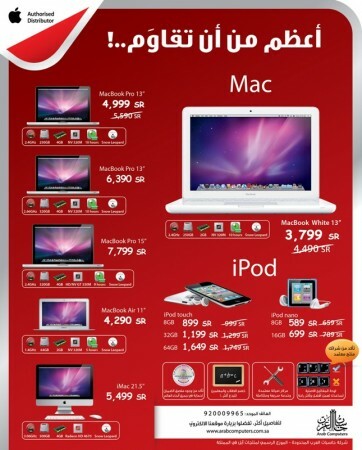 Arab Computers has announced new prices for a variety of Apple products including MacBooks and iPods in Saudi Arabia. Students get an additional %5 discount on Macs as well. A list of participating stores can be found on Arab Computers’ website. Wow finnaly some good news :D! Do I need to present them with my Student ID to in order to get the 5% ? What do you mean by “Without Facetime” for the ipod touch 4G? Both iPhone / iPod Touch & Soon enough iPad / Macbook are deprived from the “FaceTime” Feature. Get iWeaver to copy all the apps on HDD or USB Flash of yours. that way you won’t lose your apps & sync it to your account ^_^! So do I have to enable facetime when i buy it? Salam Khaled, Could you please give me your email address..
helloooo…I’m mark..i am interested this product. this is for my business…can i have a special price? please send me e.mail..this is my e.mail add. gino_ko101@yahoo.com.